Our ongoing mission is to always make sure that our customers have an amazing experience with us. Your satisfaction is our #1 priority and in addition to providing affordable high-quality products, we want to continue bringing the best service to our customers each and every day. Anything less than the best is a failure on our part and we will do whatever it takes to make you happy. If anything goes wrong with your order, such as damaged or missing products, reach out to our eager customer support team and we will make sure you are taken care of. If there is ever an issue, we have a solution and that is the mantra A3 DIRECT is built on. Set The Bar For The BEST Bachelorette Party, Bridal Shower & Engagement Parties! Add some atmosphere and wow-factor to any party, whether it be a bachelorette party, bridal shower or wedding parties, this 17 Piece Gold and White Bachelorette Party Cups are promised to set the tone in a big way. ✔ High-quality BPA free plastic party cups with white frosted shell and elegant "BRIDE + BRIDE TRIBE!" gold lettering designs. ✔ Long-lasting and reusable - simply handwash with warm soapy water and you're set to keep the party going! ✔ Each party cup is 16 Oz. which is more than enough to carry your favorite beverage, whether it be champagne, vodka, beer or a fancy cocktail. ✔ Our Customers are the #1 Priority - We Care About Your Experience! Click "Add to Cart" Above to Take Your Next Bachelorette, Engagement or Bridal Shower to the NEXT LEVEL! PARTY CUPS FOR THE BRIDE & HER TRIBE! - Add some class to your Bachelorette Party or Bridal Shower with this set of GORGEOUS rose gold "BRIDE" + "BRIDE TRIBE" bachelorette party cups! Each 16oz rose gold party cup is complete with elegant white lettering, perfect for your rose gold engagement party or bridal showers. Let's face it, the bride and her bride tribe are beyond red solo cups. Class it up and get yourselves these stunning "BRIDE + BRIDE TRIBE" Bachelorette Party Cups! GET THE WHOLE BRIDE TEAM INVOLVED! - Is the Bride Tribe rollin' deep? No problem! 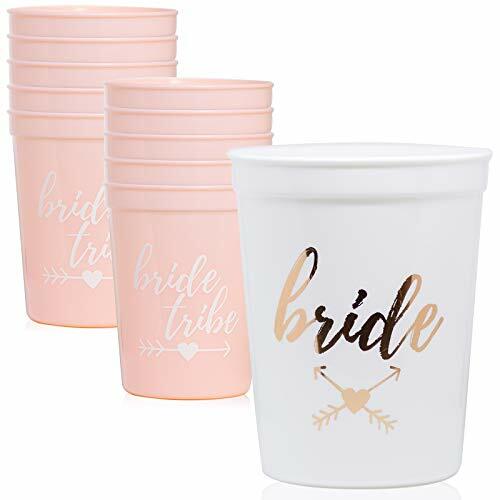 This set of "BRIDE TRIBE" Bachelorette Party Cups comes with 10 x "BRIDE TRIBE" rose gold cups for the wedding party and 1 x "BRIDE" customized Bachelorette Cup for the Bride-to-Be! Get the WHOLE bride squad buzzed with our bachelorette party favor cups and the rest will take care of itself. Because who walks around with an empty cup? Absolutely noone. Take your engagement party up a notch! BPA FREE & REUSABLE! - Drinking out of these "BRIDE TRIBE" Bachelorette Party Cups isn't the only that'll have you feeling good. Party hard knowing that your bachelorette cups are BPA free and environmentally friendly. If the bachelorette party accidently turns into a multi-day bender, you can wash last night's mistakes away by simply handwashing with soap and starting all over again. The durable make of these party cups will outlast cheaper bachelorette cups due to it's thicker shell! POUR IT UP & POST IT ON THE GRAM! - Whether it be champagne, beer or cocktails, our sturdy 16oz bachelorette party cups are up for wherever the party takes you. These gorgeous rose gold "BRIDE" & "BRIDE TRIBE" cups makes spamming your Instagram feed irresistible, letting your followers know how to do a Bachelorette Party right! No matter your drink of choice, these party cups will make any party sauce look classy. Made of high quality plastic, these cups are guaranteed to last longer than you. TRY RISK-FREE TODAY! - Our #1 priority is exceeding our Customers' expectations which is why we offer a 2 YEAR LIMITED WARRANTY with every A3 DIRECT purchase! Your complete satisfaction is backed by our promise of high-quality products and world-class customer service. If anything happens to your Rose Gold "BRIDE TRIBE" Bachelorette Cups, contact us and we will replace them free of charge, no questions asked! Try our Bachelorette Party Cups RISK-FREE today! If you have any questions about this product by A3 DIRECT, contact us by completing and submitting the form below. If you are looking for a specif part number, please include it with your message.